Kent & Essex IFCA meet on a quarterly basis, and these meetings are held in public. The agenda for the meetings and the minutes of the meetings will be published on this website. We will publish the date and location of our public meetings and the associated papers in a timely manner. From 30 January 2018 we will provide the decisions made by IFCA Members at their meeting next to the relevant agenda item. 4. EMFF Project: Filling the Knowledge Gap – Whelk Populations (R Dyer) Members were provided with an update on the progress of the EMFF whelk project in its first year. This project intended to provide an understanding of the difference in whelks within the district. Revenue Budget monitoring 2018/19 (B Gibbs) Appendix 1 Members noted and approved the forecast underspend of £74,273. In view of the expected underspend, Members authorised expenditure on items not in the original budget, details of which would be provided at the next IFCA meeting. Vessel Length and Engine Power Byelaw update (W Wright/D Bailey) Appendix 1 Appendix 2 Members approved the recommendations of the Technical Panel meeting and agreed that the exemptions to the proposed byelaw as detailed within the report would apply. Members also approved the wording of the draft byelaw subject to consultation with stakeholders. The proposed byelaw and Impact Assessment would be circulated for consultation. 2018 Cockle Fishery Management (R Dyer) Members noted the summary of the management of the 2018 cockle fishery and approved the invitation of permit holders to attend the May meetings where any future management would be decided. In relation to the allocation of any untaken TAC from the permitted cockle fishery, Members agreed to obtain legal advice. – Review the proposed byelaw wording as a whole. Revenue Budget Monitoring 2018/2019 and Ten Year Capital Renewals Plan (B Gibbs) Appendix A Appendix B Members approved the forecast underspend of £62,598 and the reasons for this. Members discussed the renewals plan for the next ten years and were advised that this forecast should be viewed taking into account Brexit and the implications of losing New Burdens Funding from Central Government. The renewals plan was noted. Cockle Fishery update (D Bailey) Members were informed that the TECFO had opened on 17 June 18 and was due to close on 28 September 18. Catch rates had been excellent although yield had varied throughout the season. As a result of finding additional stocks the TAC had increased to 6160 tonnes and then again to 6622 tonnes. This increased TAC continued to fall within that allowed through the Habitat Regulations Assessment that Natural England had approved for this fishery. Members requested that written protocols to be included within the cockle papers which described the process officers followed before making a decision to alter the TAC of the TECFO. In respect of the Flexible Byelaw Permit Fishery, this was due to open at the start of October 18. Members were advised that one letter had been received from a Permit Holder regarding the opening of this fishery for one day only. Members discussed this letter and found that the permit fee was set in the Byelaw. 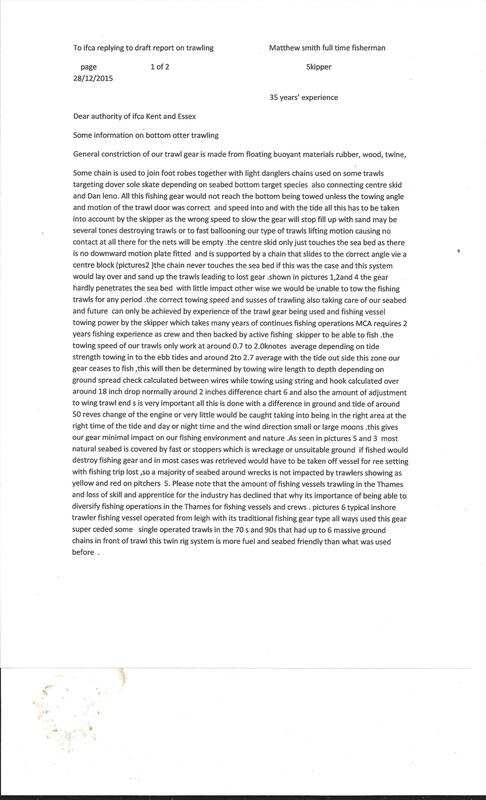 The IFCA was responsible for deciding if there was sufficient stock to fish not whether it would be financially viable for the boat to attend the fishery. BCRC Native Oyster Flexible Permit Byelaw update to include presentation by Alice Lown on her PhD work (D Bailey) Appendix A Appendix B Appendix Ca Appendix Cb Members noted the minor amendments that had been made to the wording of the byelaw and noted the further response from Mr Elbra regarding the making of the byelaw. Annual Report 2018-2019 (D Bailey) Annual Report Members agreed to notify the ACIFCO of any changes required to or comments on the Annual Report. 2017/2018 Final Budget Monitoring Outturn Report and Annual Return (B Gibbs) Appendix 1 Appendix 2 Appendix 3 Appendix 4 Appendix 5 – Members noted the report and approved the transferring of the underspend to the General Reserve and the Renewal Reserve. The Annual Return was also approved and signed off by the Chairman and the Clerk to the Authority. Cockle TECFO licenced fishery management (R Dyer) Appendix B Appendix C – Members approved the opening of the Fishery on 17 June 2018 with an initial TAC of 5390 tonnes (35 trips per boat). Fourteen licences were issued to existing licence holders with no additional licences approved. The licence fee was set at £6,244. Permitted Cockle Fishery Management (D Bailey) – Members approved the opening of the Fishery on 2 October 2018 with a TAC of 535 tonnes (1 trip per boat) for 35 permit holders. All areas except for the Dengie, Buxey and Ray Sands in Area 7 would be closed. That under Section 100(A)(4) of the Local Government Act 1972, the public be excluded from the meeting for the following items of business on the grounds that they involve the likely disclosure of exempt information as defined in Part 1, paragraphs 3 and 5 of Schedule 12A of the Act. Presentation – translating the agreed management ideas into legislation. 3. Whelk Permit byelaw and management (W Wright) Appendix A Appendix B Whelk Report (Dr Hollyman) – Members agreed that the pot limit, riddle size and number & size of escape holes remain set as in 2017/2018. Members approved the issuing of 14 day warning letters to those permit holders that had not completed catch returns since September 2017 warning of possible legal action. In addition, Members noted that officers would work with local fishermen in investigating the suitability of an automated whelk riddle that had recently come onto the market. If the Industry was interested in using this riddle, the IFCA would work with them to help them to explore grant funding opportunities to assist with its purchase. 4. KEIFCA Native Oyster Permit byelaw (D Bailey/W Wright) – Members approved the recommendation that the management of activities other than oyster harvesting in the restoration box should initially be managed through a voluntary agreement. Members approved the recommendation that the ENORI group in partnership with other invited stakeholders be asked to develop the agreement. Members approved the continuing closure of the BCRC Estuaries MCZ site for the harvesting of Native oysters to 31 May 2020 using its powers under the Shellfish Beds Byelaw. 6. Sea Angling Report (W Wright) Appendix 1 – Members agreed that officers should work with CEFAS in promoting the Sea Angling Diary 2018. Members agreed that the CEFAS angling team should be asked to present their work at the next Authority meeting. Members agreed that officers would contact angling clubs/charter boats for feedback. Members agreed that officers should report key issues to Defra/Minister and to invite the Minister to visit the District. 9. Bass legislation for 2018 (D Bailey) – awaiting finalisation of legislation from the EU. Paper will be emailed out/laid around table - No information was available as the EU Journal had not been updated. the relationship and mechanism between the byelaw and the fisheries management plan. 2. Scrutinize in detail each consultation question in order 1-14. Address by Mr Ken Green on concerns with regard to the Inshore Fishermen of the U.K. and locally. That under Section 100(A) of the Local Government Act 1972, the public be excluded from the meeting for the following items of business on the grounds that they involve the likely disclosure of exempt information as defined in Part 1, paragraph 1,2 and 4 of Schedule 12A of the Act. To review management measures specified under the technical specifications for the KEIFCA whelk permit byelaw with the aim of making recommendations on future management to KEIFCA. That under Section 100(A) of the Local Government Act 1972, the public be excluded from the meeting for the following items of business on the grounds that they involve the likely disclosure of exempt information as defined in Part 1, paragraph 3 of Schedule 12A of the Act. That under Section 100(A) of the Local Government Act 1972, the public be excluded from the meeting for the following items of business on the grounds that they involve the likely disclosure of exempt information as defined in Part 1, paragraphs 12 and 14 of Schedule 12A of the Act. That under Section 100(A) of the Local Government Act 1972, the public be excluded from the meeting for the following items of business on the grounds that they involve the likely disclosure of exempt information as defined in Part 1, paragraphs 1, 2 and 4 of Schedule 12A of the Act.